Unusually for a Speyside distillery, we distil whisky from both styles of malted barley, non peated and peated, enabling us to capture the defining taste and aroma of peat reek in a few of our special bottlings. 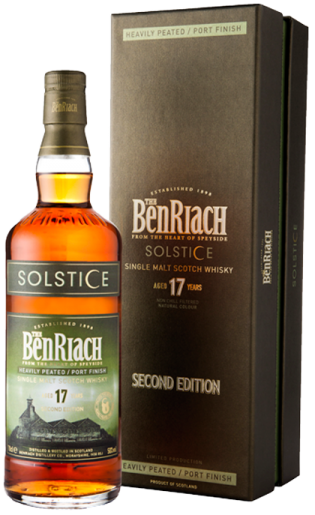 Just as the original Solstice release, this BenRiach has been distilled from heavily peated malted barley, matured in ex-bourbon casks before being finished in Tawny Port casks. This memorable malt is a superb marriage of peat and fruit, a worthy successor to our 15-year old edition. Fabulous aroma of stewed summer berries including strawberries, blackcurrants and red currants. The berry component is richly locked together by a muscular peaty blast. Latter traces of fortified wine and grape like qualities become apparent. Impressive colour spectrum, showing distinct rose characteristics, with a bright copper crest. Initial, dry roasted nutty notes flow over the palate. This advances to become a heavy peaty affair. Subtle notes of dried raisins, and candied fruit. Clean and very enticing with the dominant peat flavours lingering on the palate. Smooth and very long.